Nancy and I made an incredible roasted cauliflower soup today. We’re coming up with new (to us) creative ways to deal with so many veggies coming fast and furiously. Still to pick this week – beets, broccoli, spinach and snow peas. That doesn’t include the everyday stuff – lettuce, kale, collards and turnips. There are half a dozen zucchini’s about 4” long that could happen in a few days. Nice, smooth transition underway to the summer garden. By the end of this month all the winter stuff should be gone with the exception of the kale and collards; the green beans have sprouted; ditto cucumbers, a couple of tomatoes and we’re actually picking zucchini. We had a bad squash season last year and I think we’ve already picked more in the last two weeks than the whole season last year. The weather has been coolish, extending the life of the winter crops but not so cool that it inhibits the summer plants. Plenty of rain. We had a 2” deluge yesterday and the lake is very nearly as high it was at the peak in September. We’re still officially in the dry season so with a normal spring and summer, we could foreseeably overtop the dock floor. It sounds like Chris will be onboard in San Francisco mid April. They got a nice apartment in Walnut Creek, about a 15 minute walk to the BART system. That seems like a distance to me but compared to New Jersey and Chicago, this is a piece of cake. Especially in the winter. Peacock sighting? Our next door neighbor, Barbara, said she saw a peacock just walking alongside our road the other day and then Nancy said she saw one walking on the jungle clearing between us and the lake. I went right over and saw nothing so it’s not a confirmed sighting and for sure I haven’t heard any so I’m on the fence. But there was a confirmed deer sighting crossing the field next to our place and then onto the pathway. It was a doe and fawn. I had noticed the doe early in the morning when I went out to get the paper. That encounter was at about 25’ – close enough to get my attention when I heard something that size moving in the bushes right next to where I was walking. The second sighting was with several other people at our Easter dinner so no doubt about that one. Sure hope they don’t find the garden. Last year I saw a couple of dear nosing around the garden but, for whatever reason, they never ate anything. If they do, I’ll invite Simon here for a private property hunting trip. How’s this for a nice bass! I was going to take a nap but decided to go down to the dock and relax there – read a book while drowning a bait. So much for relaxing! Big news – Chris accepted a transfer to San Francisco, the Sephora corporate headquarters. His new district does double the volume of Chicago and covers stores in downtown San Fran and east out past Oakland plus 4 stores in Hawaii. He’s been doing the Dallas district in addition to Chicago on a special assignment for a month or so and it’s possible that all three districts will overlap for a short time. The transfer is not a big surprise since the last couple of times he visited the corporate office, the subject of a possible transfer was raised by the bosses a couple levels up the food chain. He was there a few weeks ago to check out housing and found new digs in Walnut Creek so by the middle of next month he’ll be living there. More big news – the bass are biting fairly well. I’m catching them now off the dock and out of a boat, plugging along the shore. The speckled perch season never really amounted to much so I’ve moved on to something I understand better. A couple of pics from the recent visit by our grand nephew Kassem. The nice bass was an interesting catch. He was catching small bluegill with a little kid’s outfit. The small bluegill are then used for bass bait. 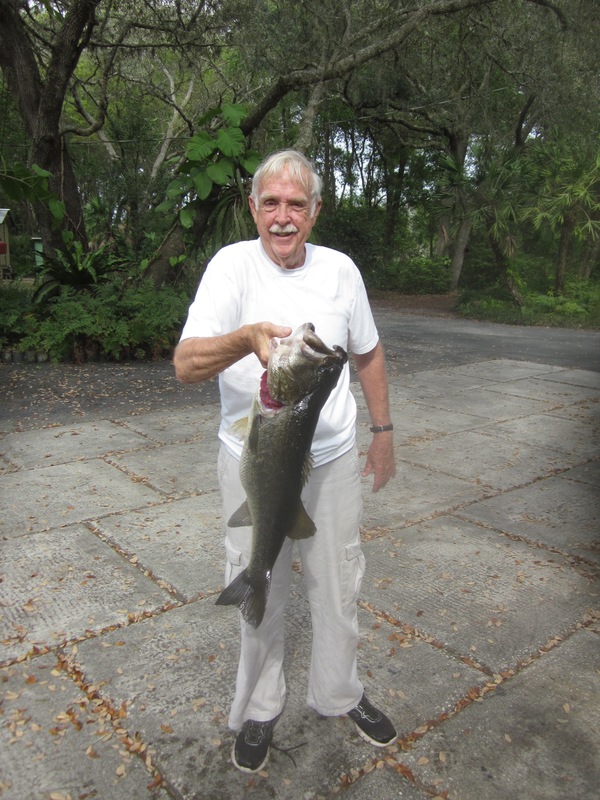 As he lifted one out of the water, a big bass lunged at the fish from under the dock. He missed it and I told him to just drop it back into the water quick, quick. He did and the bass that missed it the first time nailed it instantly. The little bait rig had a very tiny, number 6 hook so the likelihood that it would hook or hold a big bass was zero. Or so I thought. Somehow it did indeed hold the fish and we managed to land it. Congrat’s Kassem – he cleaned my clock that day. The other pic is Kassem’s hammock. He wanted to sleep out in nature so he strung it between poles on the dock and slept out. We figured about midnight he would have enough of that – listening to the night critters roaming around in the jungle – so we left the lights on and the doors unlocked. He actually slept the first night until almost 10AM and went back for another night. He and Simon are going to connect and do some real back to nature kind of camping. Who’d a thunk. The job I hate the most while Nancy recovers is shopping – especially grocery shopping. She and I just move at a different pace and have different styles so it’s really painful for both of us. But Nancy came up with an idea that seemed to work perfectly. She called out a list of what she needed in exactly the sequence they’re found in the store. I wrote down the list and sure enough, everything was in order and the whole process was fast and painless. No searching and hunting. I’m really impressed with how she can remember exactly where everything is located and can do the sorting mentally. President Trump???? another “who’d a thunk it”. Temporary cast removed from Nancy’s arm and no permanent one required – so all good news. She’s supposed to keep using the sling most of the time but occasionally stretching out the arm and introducing some motion. Max lift is one pound. The Holland Grill and I made a spectacular dinner tonight. Grilled chicken thighs and grilled veggies. Here’s the veggie recipe: pick a head of Packman broccoli at 4PM; a head of Snow Crown cauliflower at 4:05PM and rush them to the kitchen. Using half head of each, cut them into perfect florets and sprinkle with sea salt, pepper, garlic powder. Then mix with a few splashes of olive oil to completely coat. Pop on the grill for 15 minutes. The chicken thighs had been put on the grill 30 minutes earlier so the total time was 45 minutes including picking, cleaning and grilling. After putting the veggies on the grill, run back to the garden and pick a few leaves of Bloomsdale spinach, a few leaves of Summertime lettuce, two Winterbor Kale leaves and half a dozen scallions – half white and half red. Wash thoroughly, put in a large salad bowl and sprinkle some Garlic Expressions salad dressing and a few squirts of lemon juice. Have a nice little (3’x8’) potato patch going on in the garden. Accidental. A month or so back Nancy was preparing some potatoes for dinner and noticed that one had sprouted. I took it and cut off the eye and planted it. Then a couple weeks later I noticed that when turning the compost pile, there was something growing in it. Looking closely, I saw that it was actually potato peelings sprouting so I carefully probed around in the pile and found a half dozen or so that were starting to sprout. I put them all into one spot and, voila, they all seem to have rooted so this is a total bonus crop – currently at 9 plants. It’s kind of late in the season but the thing about potatoes is that you can basically harvest them whenever you want after a couple of months – the tubers just get larger with time so baby or fingerling potatoes are just young potatoes whereas the big ones are “full grown”. Also in the garden, pulled out a full row, 3’x 15’, of Broccoli. We (and lots of other folk) have been eating off this row for a couple of months and it’s fairly well played out. I still have a few plants scattered around in miscellaneous garden locations that have not popped yet so the broccoli season is still alive. Good timing since I need to get corn in, now. I planted 3 rows, 3’x15’ . I know, I swore I would not plant corn this summer but I learned a few things and will try one more time. I also pulled the last of the carrots, a dozen or so, and replanted the spot with bush beans about an hour later – so no lost time. So with the squash plants growing like crazy, the transition from winter to summer crops is well on it’s way. Had a great visit this past week with our great nephew Kassem. He drove down from South Carolina and spent a few days here at the lake. We got in some fishing, some boating, and he got to spend time with his aunts, uncles, and cousins who live within an hour of us. 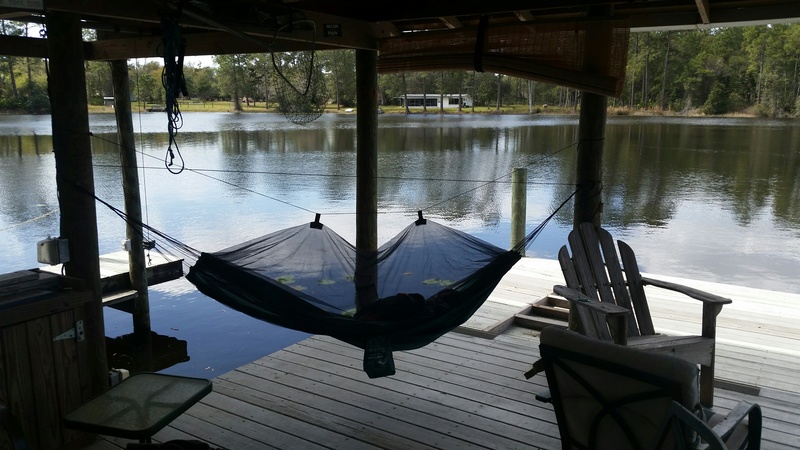 He’s turned into an outdoorsman and set up a hammock on the dock where he spent two nights sleeping out in the wild. 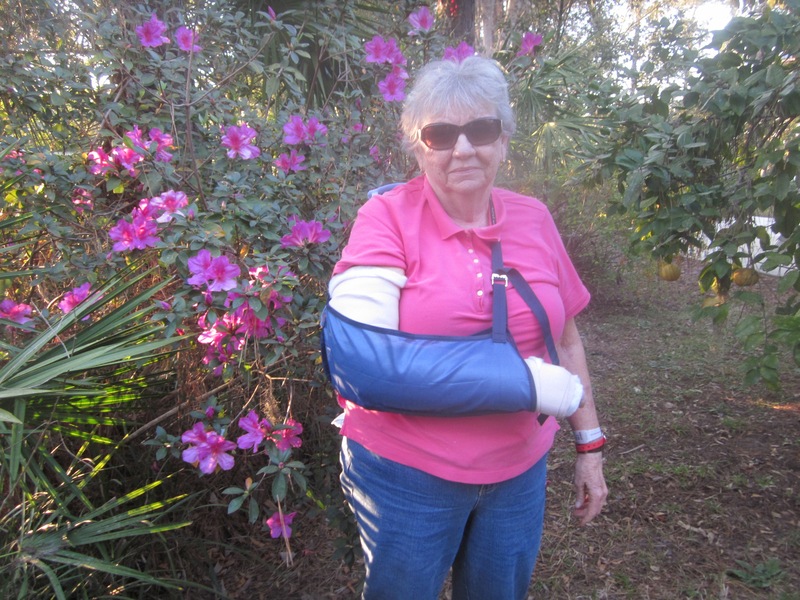 My bride has a new handicap – a broken arm. After a good meeting with they eye doc where her eyes showed improvement and the interval between shots was increase to 10 weeks (from 8) she wanted to do a little celebratory shopping. I had the laptop and a good book so off we went. Trip and fall led to a call to 911 and eventually to the ER where she was diagnosed with a broken arm. Not a bad break but certainly something to deal with and make her life more complicated. 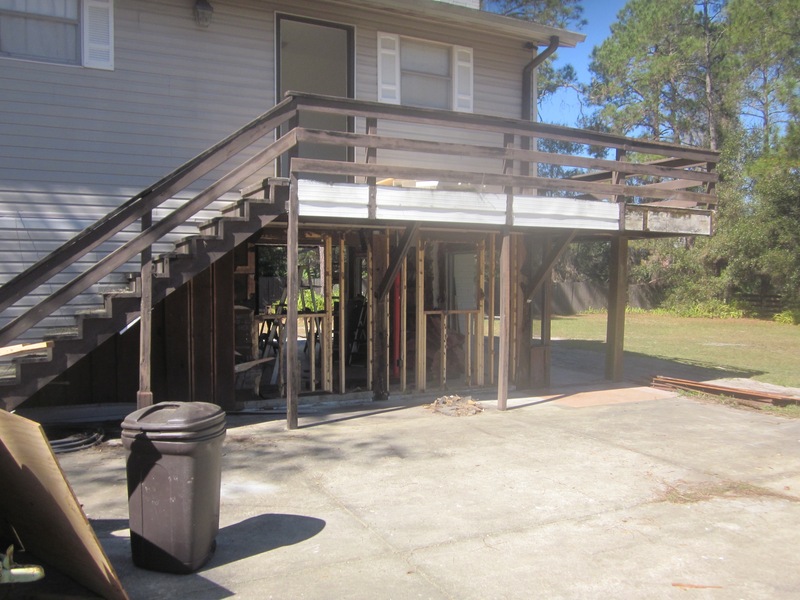 The pics show progress on Garrett’s house. Since the last pics we basically finished the lower half of the south wall and most of the east wall. The stairs you see, on the east wall, will be cut off and moved to the north side to access the deck and the upper level. George thinks we can do that without disassembling the stairway. I have my doubts. What you don’t see is an area behind the steel quonset hut we cleared and leveled to become the material storage area. Why not put the material in the hut you ask – it’s currently storing all the tools, work benches, doors, windows, lawn mowers, tractors and eventually furniture from their current dwelling. The bass fishing meter has moved from red, through the light green and now solidly in the green. Got 4 today fishing off the dock using live bluegills for bait while reading a new book. I kept one that just fit my keeper slot – that’s a one meal fish for us. Any smaller or any bigger and I release them. I also am starting to consistently pick up a few casting lures from the kayak. Tomorrow’s dinner will be fried bass with a broccoli and cauliflower salad as the side. That’s what you call a home grown meal. Here’s another “oh wow” from the Daytona Trib – a lady living in an apt on the intercoastal Waterway, aka the Halifax River, opened the door and her small dog, a Shih Tzu fell (or jumped) off the seawall. She called 911 and both the fire dept and “Beach safety Ocean Rescue” came to the rescue. Unfortunately they gave up after about an hour searching. The dogs owner said she had just gotten the dog (Ginger) and it was “not familiar with the surroundings”. This article took up 8 column inches of space.